Ahhh not a bad theory man, however...Don't be one to forget that perhaps people arnt using tech cards like Zihi because some people don't have every card. Nor the dust to craft them either. Beyond that, I feel the problem is people attach themselves to opinions of others an then accept a loss because of someone else's statement as to why. Example: I lost this game because HS is just rock,paper,scissors nonsense. That's pretty good, but you can tell who doesn't play rogue.When they try to preparation, coin into Raiding Party. What's wrong with that play you ask? Well...if you have to ask, here's your sign award. 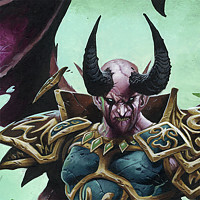 02/16/2019 08:32 AMPosted by MarigoldToday in Wild so far, I've played against three people who had Prince Malchezaar. Wow! I guess it's Prince Malchezaar Day! :-)Reported for having fun an enjoying HS! What class are you using Mechathun with? Priest? Ahh dude who knows. Prob some fugly girls complaining a pixel art character on HS had Hooters.You'll notice a lot of people lack spines anymore. People think they gotta cater to everyone. It's just so stupid, I laugh all the time over such things. I don't want to see bannings like those you described.Though I would love to ban a class from time to time in casual mode. I mean it's only casual so why not. I'd be banning Big ! @#$% Priest an Pirate Aggro Rogue off an on weekly. Caught in the crossfire, I tend to agree with Goramier. I felt like the guy didn't do anything useful an certainly never passed on good information to the devs. Or even tried to get them to give us a blog on updates for the game etc. Which I had advocated for in the past.